While playing with Microsoft Word 2007, I noticed something new today. When I clicked on “New” under the “Office button“, it showed “New blog post“. I do not remember being able to post to a blog directly from Word before, but then again I do not ever remember looking. Does anyone know if this is a new to Word 2007 feature, or did I just miss it in Word 2003? Below is the dialog box that appears when you click “New” from the “Office button” menu. When I selected the “New blog Post” document a wizard opened for me to register my WordPress, or other blog provider, account information. I have a self-hosted WordPress site and had no problems with the account setup. I was surprised that I did not have to make a single change in my WordPress admin panel to get this to work correctly. Current, Microsoft Word 2007 supports the following list of blog providers. I have only tested it with a self-hosted WordPress site. Once you have selected your provider, you will need to enter your blog URL and log-in information. Be sure to change only the “” text. 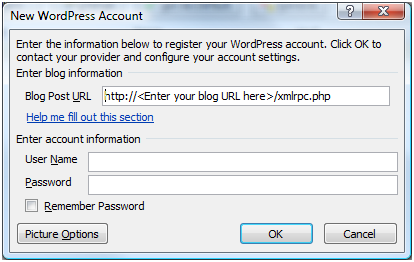 Then enter your blog’s username and password. This information is passed in clear text to the blog. If you have concerns about your blog’s security, you should consider setting up an SSL certificate as the default log-in is most likely completed in clear text. I have not set my blog to use SSL, but I see no reason why I would not be able to use SSL with Word 2007 by simply changing the “Http” to “Https” in the below URL. I left the “Picture Options” information as default and had no problems have my images being displayed correctly or having Word 2007 automatically uploading the images to my server. Click “OK” when you have filled out the information, and If it is able to access your blog, it will give you a conformation dialog box. Outstanding! 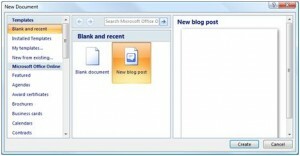 You are now able to create posts and publish them directly to your blog from Word 2007. I was able to add multiple categories from the “Insert Category” icon on the Word 2007 Ribbon menu, but not post tags. You are able to open and edit prior posts using the “Open Existing” icon in the Word 2007 Ribbon. 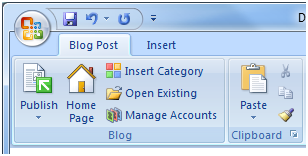 The “Manage Accounts” icon will allow you to setup multiple blogs to work with Word 2007. Once I completed my post, I publish it to my blog by simply using the “Publish” button. I opened the post in the default WordPress editor and added image titles and post tags. I will look around to see if i can find a way to do this from Word, but so far, no luck. I was surprised by how clean the code was in the HTML view. This is not a bad option for creating posts for a blog. Most of the more advanced formatting worked just fine, which I was very pleased about. Even my image placement worked as designed. While this is the not the prefect blog post publisher, it is one of the better ones that I have used. What do you use to create your blog posts? Have a recommendation for an alternative software? but i need to know, how to setting image provider? for Upload URL and Source URL if my blog use blogspot and drupal?